On this configuration, you can set the common attributes of the applications created by ScriptCase. Application Code : Code of the application that’s determined at the moment the creation of the application, this code can be renamed in the List of Applications. Description : This field is reserved for a brief description of the objectives of the application. Documents Path : The absolute path to the documents directory of the application. Image Directory : Base directory of where the application images are stored. 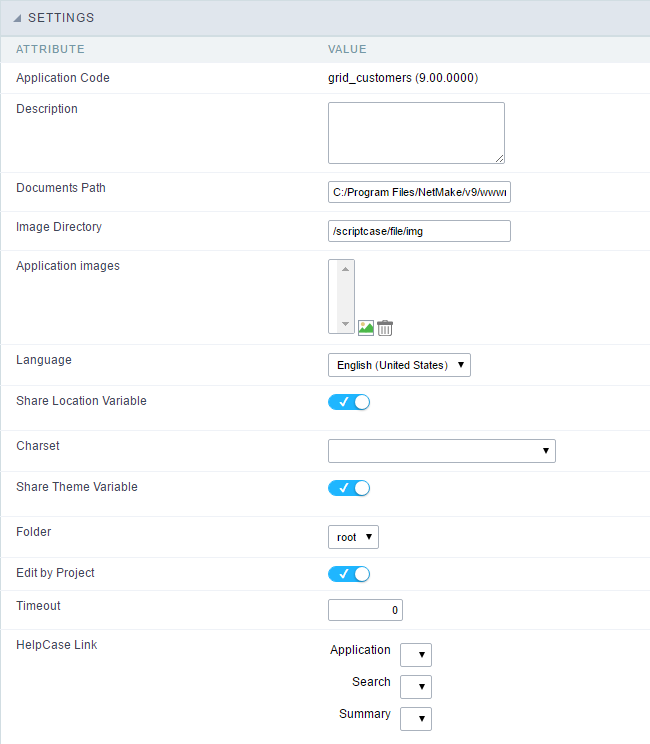 Application images : Allows to import images into the application and using them in the application routines, disregarding the macro sc_image. Language : Language of the generated application. All the hints and messages are displayed in the selected language. Share Location Variable : Shares the Location settings with other applications based on the value of the session variable. Charset : Defines the specific charset used in the application. Share Theme Variable : Shares the Theme settings with other applications based on the value of the session variable. Folder : Folder where the application’s stored in the work group. Edit by Project : Allows for the other users of the group to edit the application. Timeout : Time of the runtime timeout in seconds. If the value is Zero, it assumes the default timeout of the PHP. HelpCase Link : Associate the files of the HelpCase with the application. Script Error : Allows to display the information of the Script Line where the error occurred. SQL Error : Allows to display the SQL where the error occurred. Debug Mode : Runs the application in Debug mode, displaying the SQL commands the moment that they are executed. Ajax Error Output : Open a window of debug with the output of the Ajax.